DMarket is the first decentralized marketplace that permits gamers from all over the world to trade or exchange in-game goods starting from any gaming platform like Dota 2, Counter-Strike: Global Offensive(CS GO) and much more to come with the Blockchain Technologies. DMarket Token sale was launched on August 17, 2017, and raised more than $10 million on its 1st token sale phase and the second phase will start on 3rd of November. DMarket is a new platform where gamers, developers, and business people can efficiently and securely assess, purchase and sell virtual items. 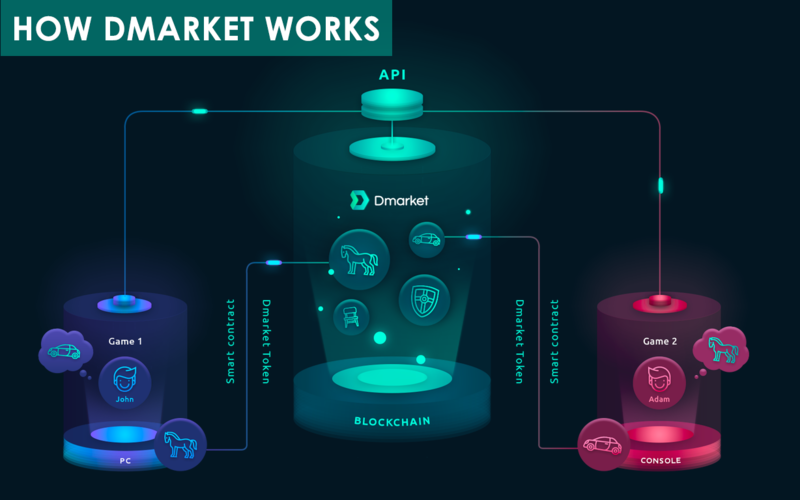 DMarket team is developing a marketplace based on Blockchain and smart contracts that enables a one-click sale, exchange or trade of every virtual item between all games with the use of the DMarket token (DMT). The DMarket token (DMT) will be the only currency/money on the platform, providing several options that affect every exchange, trade, fee and smart contract. After the Token sale period, all investors will receive an ERC-20 exchangeable. DMarket Token on the Ethereum network. After the launch of the central DMarket network, it will be exchanged 1-to-1 with the primary DMarket coin. All digital goods are set with a DMarket coin value. Every in-game item will have a form of DMarket token in the DMarket coin wallet. All transactions of digital goods are made in DMarket coin, with DMarket coin-evaluated prices. Fees are paid in DMarket coins at asset creation and asset exchange, using blockchain confirmations. In other words, the DMarket coin is the money that runs DMarket. 4A Games - 4A Games is multicultural game dev studio known for the atmospheric FPS, Metro 2033, Metro: Last Light, Metro Redux & the upcoming titles ARKTIKA.1 & Metro Exodus. GSC Game World - GSC Game World is founded in 1995, GSC Game World has become the most renowned game development studio in Ukraine and a leading developer in Europe. Since 2004 the proprietary worldwide publishing branch has been operating within the company. Tatem Games - Tatem Games develops versatile games for the mobile market. It was developed from PC game development company Action Forms (Carnivores, Vivesector, Cryostasis) worked on Palm titles and currently produces games for mobile smartphones. The DMarket Tokens will be sent to the User’s respective cryptocurrency wallet by the end of DMarket Tokens Sale phase #2. DMarket used their knowledge of the gaming world to balance the Blockchain technology as a solution to a problem that has hindered the cross-border and cross game issues. They have recruited Brain Kerr, an eSports and gaming investor, onto their board as an advisor, as well as GSC Game World and Tatem Games who are already supporting the project. Oren Klaff, the founder of Intersection Capital, also joined the DMarket Advisory Board. Important Notice: Regarding the ICO deposits, please don't use any exchanges to send ETH. Use personal wallets like MyEtherWallet, and Metamask. If you're sending ETH from exchanges Dmarket won’t be able to recognize you and won't send you tokens.